After months of negotiations, it appears that airlines have reached an agreement on how to pay for the new terminal at Kansas City International Airport. KANSAS CITY, Mo. 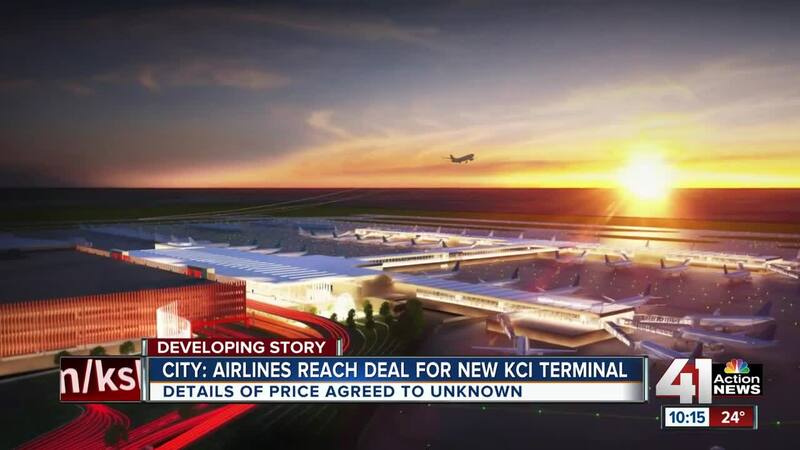 — After months of negotiations, it appears that airlines have reached an agreement on how to pay for the new terminal at Kansas City International Airport. Councilwoman Jolie Justus announced the news Wednesday night in a tweet. Great news! Just received confirmation that airlines have an agreement regarding #NewKCI . Airline reps will be at Airport Committee hearing tomorrow morning to discuss. Justus' announcement came less than an hour after several council members shared concerns with 41 Action News about the airlines' willingness to pay full price for the new terminal. "The developer submitted $1.64 billion, and I think the airlines are coming back with $1.5 billion," said Councilwoman Teresa Loar. Previously, smaller carriers Allegiant Air and Spirit Airlines had expressed concerns over the $1.64 billion price tag, plus the allocation of costs for the baggage handling system. 41 Action News reporter Cat Reid reached Southwest Airlines officials Wednesday night, who confirmed they are OK with the new agreement. It's not clear if other airlines operating at KCI have signed off. In a statement to 41 Action News, Edgemoor's Geoff Stricker said the company is on board with the new agreement. "Edgemoor has been working closely with both the airlines and KCAD to advance the single terminal project. We are in strong alignment, and look forward to beginning an exciting new chapter on this project," Stricker said. As of Wednesday night it is still unclear what number the city and airlines have landed on, but Mayor Pro Tem Scott Wagner suspects it will be lower than $1.64 billion, and contingency could be lower as well. "At the end of the day, the airlines can say this is the amount that we want to spend. We have to figure out if we can build it for that," he said. If the price is slashed, Loar hopes it doesn't come at the terminal's expense. "The one thing I don't want is to compromise what we're getting as an airport with that cut in price," she said. Airline representatives are expected to attend an airport committee hearing on Thursday morning.